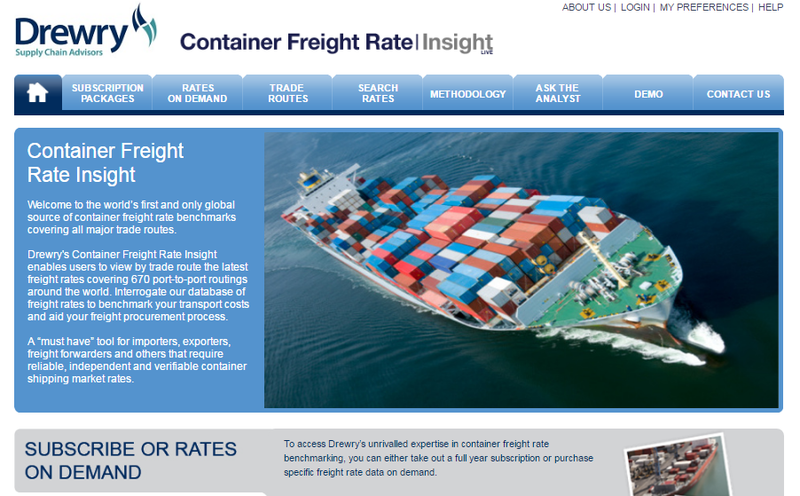 We have been aggregating, mining and publishing ocean freight rate intelligence for over a decade and were the first to publish benchmark container spot market freight rates back in 2006. Compare your rates with industry benchmarks and save! "The Benchmarking Club data allows us to see trends from both the market and Drewry point of view which provided strategic value on what to expect during the upcoming procurement process. The comparisons of our company’s position in transit times, rates, and shipment methods are of particular value." Weekly on five key trades via Drewry’s Hong Kong-Los Angeles Benchmark and data from the World Container Index. Each benchmark includes rates for both 20ft and 40ft dry box containers. Key trade routes covered include the transpacific, Asia-Europe, transatlantic, Middle East & South Asia trades, North-South trades (South America, Africa & Oceania), intra-Asia and intra-Europe trades. In most cases rates for both headhaul and backhaul trades are provided. Search and select single or multiple port pairs to view and download current freight rates of your choice to your device. 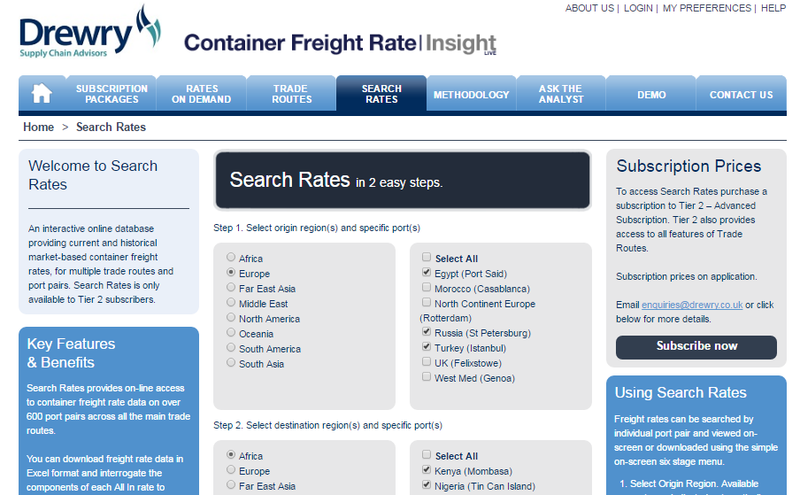 Select and download freight rate history going back on 2006 to assess key trends and trade cycles. Download freight rate data to your device in Excel format. Download either all-in rates or a breakdown of the base rate, bunker adjustment factor (BAF) and terminal handling changes (THCs). Track past rates with access to rate history. N.B. The rate benchmarks represent spot market rates for Full Container Loads paid by freight forwarders to ocean carriers for a particular month or week. They are affected by seasonal and short-term supply-demand factors, notably by the peak season in the trades from Asia. Closely aligned to our spot rate service is Drewry Benchmarking Club an exclusive, participation-based service open to importers and exporters which allows them to track their contract rates against their peers. Membership to Benchmarking Club is open to importers and exporters only - not Freight Forwarders or NVOCCs - and allows participants to confidentially benchmark contracted ocean shipping costs against their peers. Member organisations provide their contract rates confidentially to Drewry. In exchange, we aggregate these with other members’ rates and provide anonymous benchmarking information for each member’s specific routes. NB As part of their package all members benefit from complimentary access to an advanced subscription to Container Freight Rate Insight. 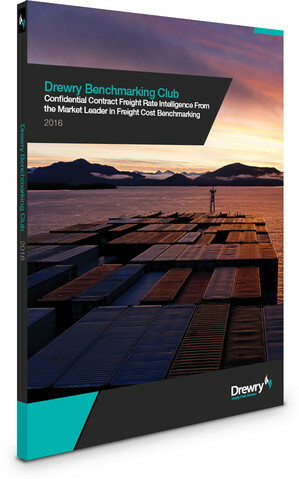 Drewry’s Forwarder Benchmarking Club is designed to meet the specific needs of freight forwarders and non-vessel operating common carriers (NVOCCs). It provides members with the opportunity to confidentially benchmark their ocean carrier buy rates against their peers. NB The service is FREE to early adopters.